Serena Williams’ ninth title at the Miami Open has been deferred another year. The world number one was upended 6-7, 6-1, 6-2 by 2006 champion Svetlana Kuznetsova. Although Williams’ battled her way into the fourth round, history was on her side. The ultimate time she was bounced prior to the quarterfinals was in 2000 by compatriot Jennifer Capriati. With a 3-0 lead to open the match, Williams appeared in control. Not surprising considering her 8-2 record over her rival. However, the world number 19 returned the favor by capturing the next three games. After salvaging three break points on her serve to get 4-3, Williams failed to capitalize on two opportunities on her rival’s serve. As the Russian dug in her heels, the first set went to a tiebreaker. Serena claimed it in dramatic fashion with a return winner, a primordial scream followed. At that point, Kuznetsova could have wilted under the humid South Florida weather. To the contrary, it was Williams who faded. Up 2-1, Kuznetsova performed like the two time majors champion that she is, forcing Williams into a bevy of mistakes. In less than 30 minutes, she pocketed the next four games to assure that the quarterfinalist would be settled by a third set. For Williams the three time defending champion, more bad news was on tap. The top seed surrendered the initial gave of the decider at love. Soon, Kuznetsova sealed a double break 3-0 edge. 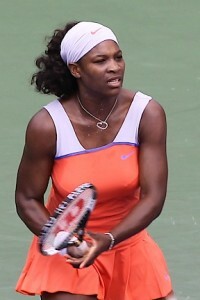 Williams finally halted a run of eight consecutive games by her rival for 3-1. With an uncooperative serve and a sleuth of miscues from both the forehand and backhand wings, Williams had no reply to Kuznetsova’s brilliance. The Russian finished off the world number one and the match with a love hold. Upsets was the order of the day. 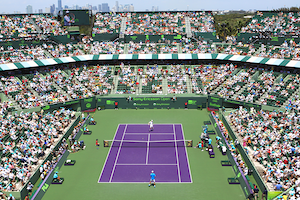 In the first match, Switzerland’s Timea Bacsinszki shocked 2012 Miami Open champion Agnieszka Radwanska. Subsequent to winning only two games the first set, the Swiss outplayed the world number three to record a 2-6, 6-4, 6-2 to advance to her maiden quarterfinal in Miami. Simona Halep, ranked fifth, came through her contest with Britain’s Heather Watson unscathed with a 6-3, 6-4 victory.